Chelicerata is one of the major arthropod groups, characterized by a body divided into two tagmata, prosoma and opisthosoma, while the name Chelicerata refers to the chelicerae, the chelate first pair of appendages. Chelicerates comprise the arachnids (spiders, scorpions, mites, etc. ), the extinct eurypterids (sea scorpions) and the xiphosurans (horseshoe crabs). Among Recent groups the limits of the Chelicerata are well defined, i.e. arachnids and xiphosurans, though the position of pycnogonids (sea spiders) remains uncertain (King, 1973). 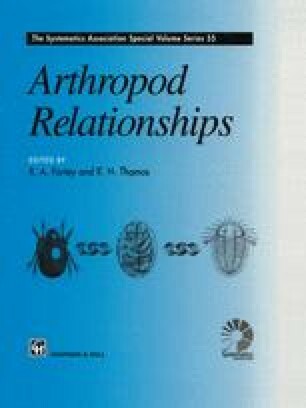 Phylogenetic relationships within the Chelicerata remain unresolved (Weygoldt and Paulus, 1979; van der Hammen, 1989; Shultz, 1990). When fossil taxa are considered, the limits of the Chelicerata become less well constrained. This is especially true of various problematic arthropods: fossils such as aglaspidids (Raasch, 1939), chasmataspids (Caster and Brooks, 1956), Sanctacaris Briggs and Collins, 1988 and other Burgess Shale-type arthropods (see Conway Morris, 1992 for a review).